Do Border Collies Get a Different Treatment for Heartworms? Heartworms, shmartworms. I'm too busy working to worry about them. Your beloved border collie is such a workaholic, it's hard to imagine that even heartworms could slow him down. Realistically, however, they could and they would. 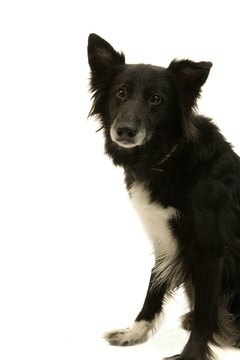 Some collie breeds show sensitivity to ivermectin, the dewormer used in some canine heartworm medications. Your vet can test your dog for this potential reaction. If your dog has the potential to be bitten by a mosquito, he has the potential to suffer heartworm disease. If a dog is bitten by an infected mosquito, heartworm larvae eventually mature as worms in the lungs and heart. Infected dogs can carry as many as 250 worms, according to the American Heartworm Society. Getting rid of these parasites is far more difficult than preventing them in the first place. Before your dog is put on heartworm preventive, he must test negative for the heartworm microfilaria, or baby heartworms circulating in his bloodstream, before receiving the medication. The broad-spectrum dewormer ivermectin often is used for heartworm prevention, marketed under the brand names Heartgard, Tri-Hart and Iverhart for dogs, and other names for horses and cattle. It's given once a month as a chewable tablet. Some collie and collie-mix dogs, including border collies, might experience a possibly fatal reaction to ivermectin due to a genetic defect affecting the blood-brain barrier. Topical and injectable products containing moxidectin also might cause adverse reactions in collie types. Genetic testing for this defect is available, and your vet probably will recommend testing for your border collie. If you don't want to have the testing done, it's probably better to be safe than sorry and go with an alternative heartworm preventive. Although the risk of a bad reaction is fairly low, these odds don't make it easier if it happens to your dog. If you're looking for flea, tick, heartworm and internal parasite control in one monthly topical product, selamectin is the answer. Marketed under the brand name Revolution by Pfizer Animal Health, this prescription-only medication is safe for dogs sensitive to ivermectin. Selamectin not only kills fleas, but prevents egg hatching. It does so for the American dog tick, but not other types of the bloodsucking insect. It gets rid of ear mites and sarcoptic mange. If your border collie is sensitive to ivermectin, that doesn't mean effective heartworm control isn't available for him. Milbemycin oxime, marketed under the brand names Interceptor and Sentinel, prevents heartworm disease while also getting rid of roundworms, whipworms and hookworms. The medication, which requires a veterinary prescription, comes in tablets of various dosages. Your vet prescribes the particular size based on the size of your border collie. You give it to him once a month during heartworm season, which could be year-round depending on where you live or where you might travel with your dog. American Working Collie Association: AWCA Brings You the Latest Research on Drug Sensitivity in Collies.